How Can a Christian Get Huge Muscles? But in any workout, there usually is some type of weight-lifting…designed to make you stronger. In Colossians 1:11, it says in order to walk close to God…we need strength, power, & might. It’s time for some weight-lifting. And when you do, you don’t produce huge biceps and superior lats…no, you get something much better – endurance, patience with joy. Doesn’t that just describe life. Write that phrase down – “Endurance and patience w/ joy” and repeat it often throughout the week. No matter how hard I try to bench 500 pounds…just not going to happen unless two big guys pulling it off my chest before I die. This is life – and it is heavy lifting – sometimes the weight seems too much and we call on God for a spot…when we should be depending on Him for all of the lifting all along. “Strengthened” – this literally means a regenerating power – not just a one-time power up at salvation hoping to last a lifetime – God will strengthen you till you meet Him in glory. This strength is a power that comes from God. Have you felt that power? I know I have. In tragedy – God gave me power to get through. In temptation – God has given me power to fight through. In trials – God gives me power to suffer through. You know, there are those that don’t believe in God and his power – ask them this – You prove to yourself there is no God. Congratulations…now what do you have? “Endurance” – resisting the urge to fight evil with evil or take revenge. Fight another way – by persevering to the end and not quitting in the Christian life. Charles Spurgeon said “By perseverance the snail reached the ark”. Don’t quit when life gets tough. Job loss – don’t let your pride make you unbearable. Don’t try to fight with other means like bitterness, anger, or hate…it will take you down the wrong road. “Patience” – steadfast, one who will not be deterred from the ultimate goal – even through immense trials and difficulty. This is not the weight-lifter that sits on the machine “waiting around” – this is like a runner battling through cramps and pain to finally reach the finish line. Body-builders grinding it out only to see results later down the road – isn’t that what life is like? “Joy” – is a sign of a strong Christian walk. Some of you today are lifting some heavy weight right now, some incredible burdens – but it is the inner strength that comes from the Lord – still find joy in these times. It’s not a passive or emotionless joy. Even when we know the ending of a movie/documentary, we still may cry tears in the middle…we are in the middle of God’s story, and we know the end…but we still may hurt. But God gives us the strength to have joy even in the struggles, pain and disappointment – that’s the power of God. There’s a reason why runners do weight training – so they have endurance and strength to fight to the end. God can give you that strength to fight to the end. God can part the sea, make the sun stand still, and create the universe in 6 days…but He can’t make you have patience…what does that tell you? God will do all He can to put you in a position to endure and have patience with joy. Will you let Him train you in your patience & joy? Evangelism. Several thoughts, images, and experiences come to mind when you read that word in italics. There are numerous methods, places, and relationships that evangelism can occur. Evangelism may happen at a ball game, in the office, on a mission trip, at a church event, or over the fence to a neighbor. But what is in that conversation? I hope and pray at the center of that conversation is the unfiltered, pure, non-watered down, precious, incomparable message of the Gospel. So, when I suggest we begin by discussing something new, I’m not coming even close to suggesting we present a new gospel. Let’s be eternally clear on that before we move along. Here’s what I mean. As I read Revelation over the past month, something jumped out to me. Maybe it is time we talk about something new. I’m talking about the NEW heaven and the NEW earth. When is that last time you had a conversation about heaven? When have you talked to your students or kids about what heaven will be like? 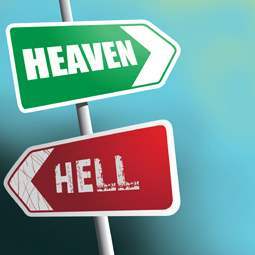 Do your neighbors have a proper view of what heaven will be? The believer becomes excited about what eternal life is like, and will inspire them to share the Gospel to those that do not have heaven as their eternal destiny. The non-believer will begin to ask questions, leading to a conversation of how to get to heaven. Christians will wake-up to the realization this place is not their home, and begin removing distractions and repenting of sins that get in their way of living for eternity, rather than the present. The non-believer may be more open to discuss eternity when you talk about the end result of glory, rather the alternative of eternal damnation. When you talk about the marriage that will happen in heaven, you want to start working on your invitations!! Disclaimer: For the critic, no I am not suggesting we eliminate the discussion of hell in our conversations. That has a place, and should never be removed for fear of offense. I’m merely suggesting we include or begin more conversations about heaven.